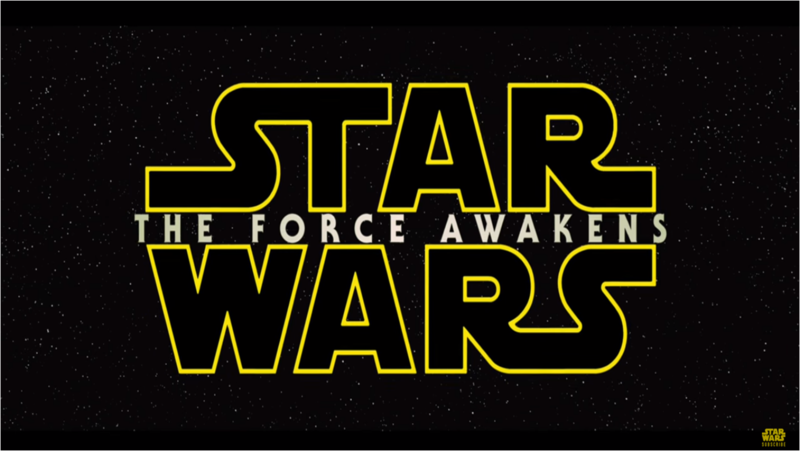 The third and final trailer for Star Wars Episode VII: The Force Awakens has finally been released, and it has led to much speculation and rumors on the Internet. 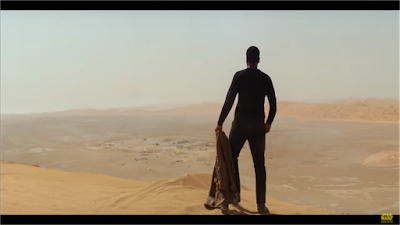 There's so much to digest and comprehend in this new trailer, which is why we will be breaking down and analyzing the trailer shot-for-shot and speculating as to what may happen in the film. You can see the new trailer here, as well as read our editorial on how much money The Force Awakens could make at the box office here. With that out of the way, let's break down this trailer! 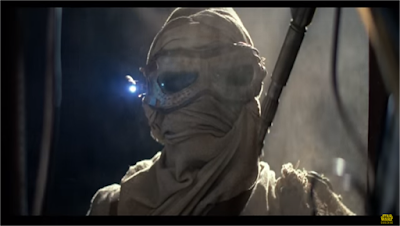 And here is our opening shot of the trailer, featuring Rey (Daisy Ridley) dressed in full gear. 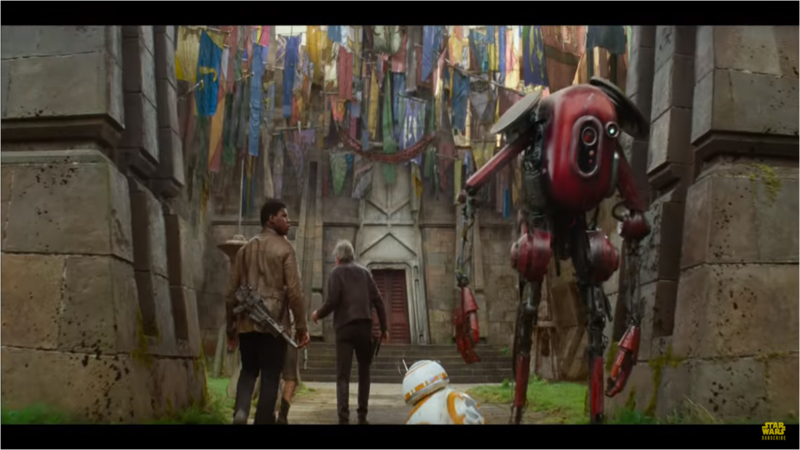 This scene definitely has an Indiana Jones feel to it. Rey is exploring the ground. Whether she is specifically looking for something or if she is just scavenging is up for debate. I will be saying this more than once, I guarantee it. 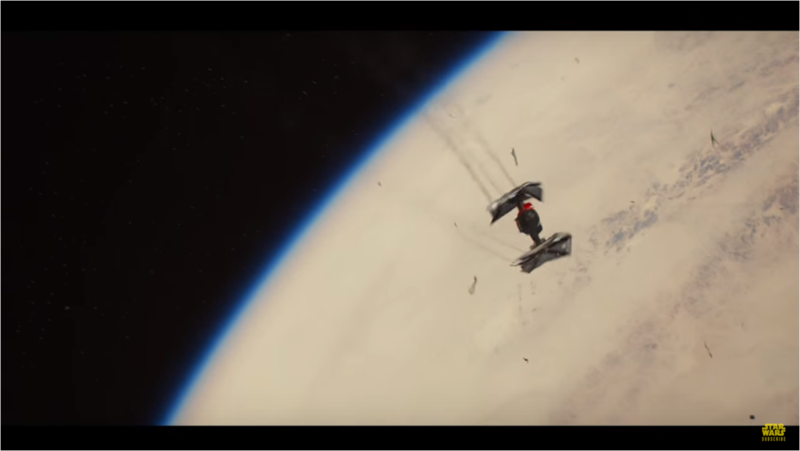 The cinematography in this trailer is absolutely beautiful! It looks like Rey is exploring the inside of the Star Destroyer seen crashed on Jakku. 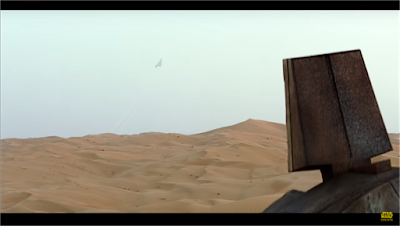 My guess is that Rey has found something in the Destroyer that is very important, and someone doesn't want it found. This is probably what kicks off the story, and the First Order chasing after her. 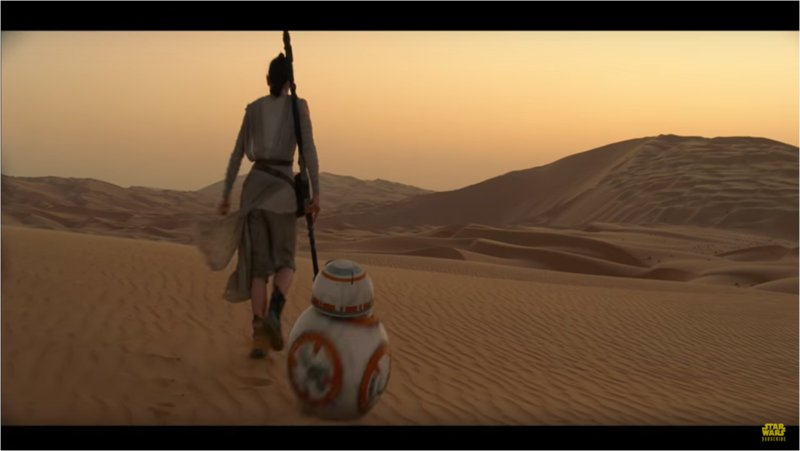 Rey and BB-8 walking across the desert planet Jakku. 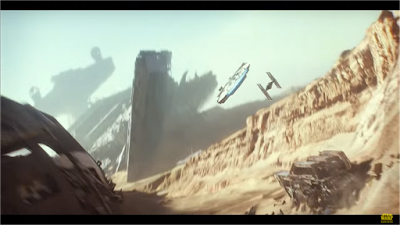 Another shot on Jakku, of a ship taking off. This shot of Rey tells us a lot about her character. 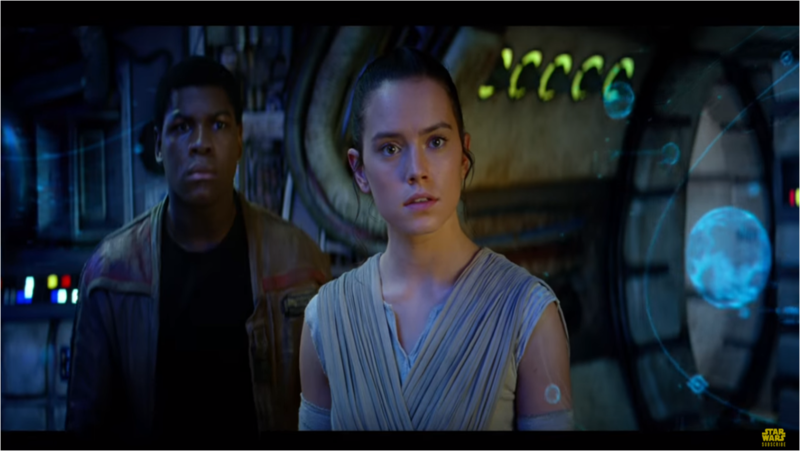 The look of sadness and isolation in Daisy Ridley's face gives us a glimpse about her personality. 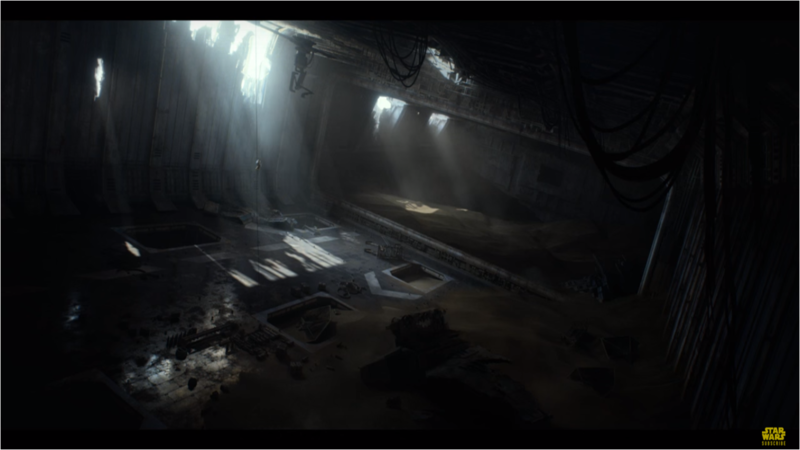 She feels alone and unimportant, similar to how Luke felt in the beginning of Star Wars Episode IV: A New Hope. 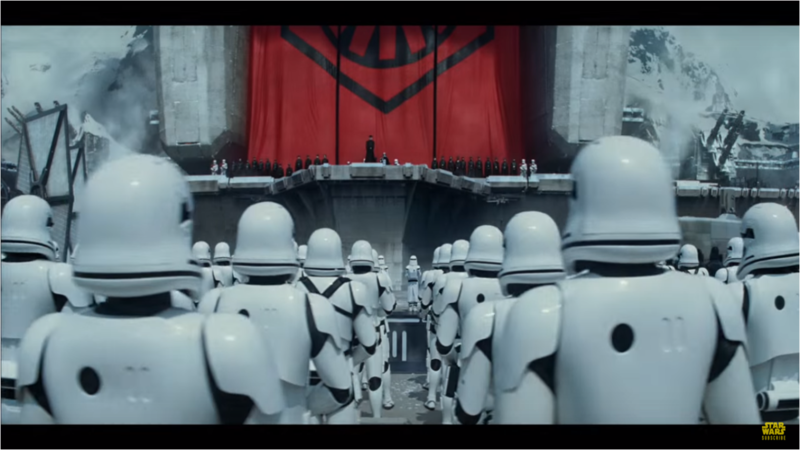 We've seen this shot of the Stormtroopers aligned as the First Order. But who is it talking to them? My guess is Supreme Leader Snoke (Andy Serkis). We continuously see this shot, but it is never up close. 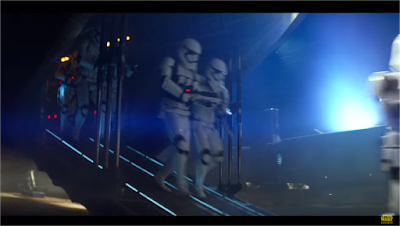 Since they are clearing saving the reveal of Snoke, then this person addressing the Stormtroopers must be Snoke. 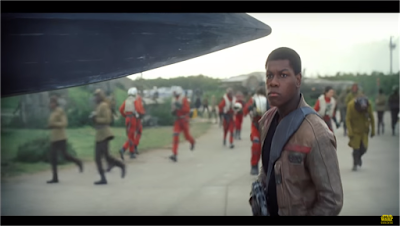 In the trailer, Finn (John Boyega) says that he has nothing to fight for. My guess is that he has been trained since birth to be a Stormtrooper in the First Order, but as he's gotten older, he's realized that what the First Order does isn't necessarily just, and his innate sense of good causes him to go rogue and leave. 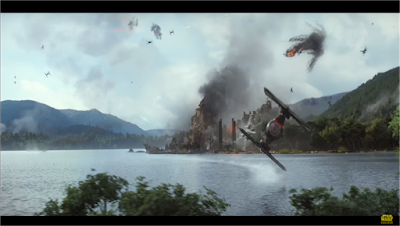 We see Finn's ship shot down and crash on a planet below. He can't be a casualty of a battle, because the shot of space is relatively empty. 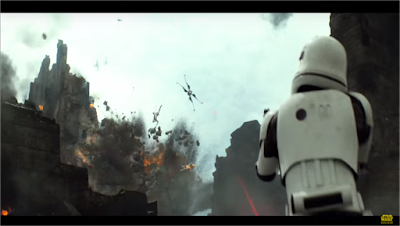 I think he made a run for it and was trying to escape, but a First Order shot him down. 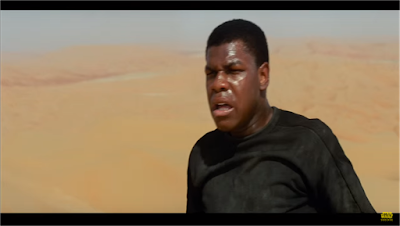 Finn's ship falls towards Jakku. So Finn definitely finds himself on Jakku by accident. He doesn't come here intentionally. He crash-lands here, and he will ultimately find Rey in that city. Looks like there's not much AC in his ship. 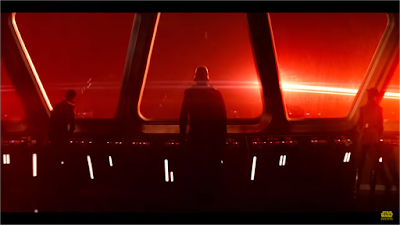 And here's our first look at a classic J.J. Abrams' lens flare. It works perfectly in this shot, as the camera pans in on Kylo Ren (Adam Driver). In the new poster, we saw a Death Star-type device, which is being called the Star Killer. 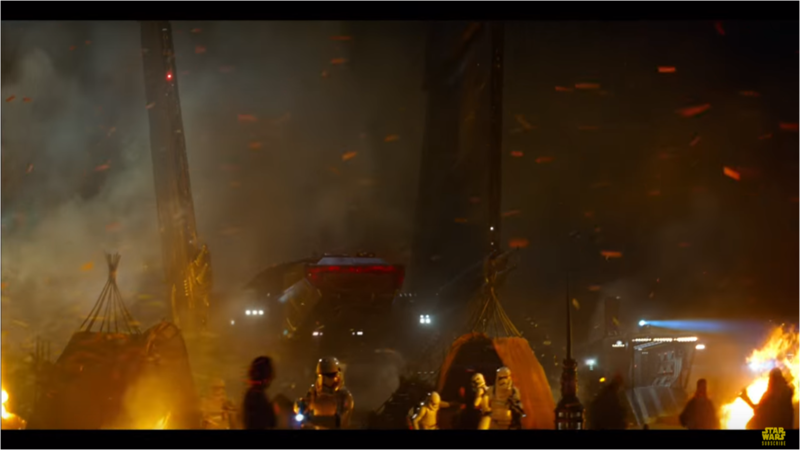 It looks like that may be Kylo Ren's headquarters. 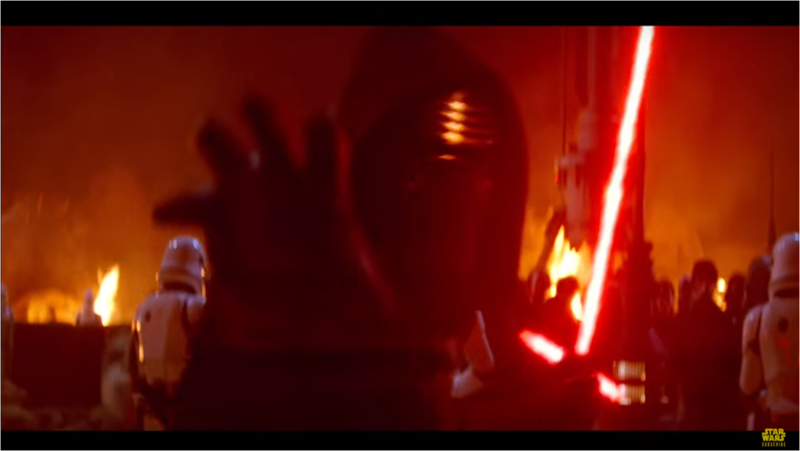 Kylo Ren's voice works perfectly. I said this in my initial review of the trailer. It's robotic, like Darth Vader's voice, but it's different. It's also recognizable, so you can tell who it is when he speaks. Now here's where things get really interesting. We see the shot of Vader's burnt mask, and Kylo Ren says "I'm going to finish what you started." So what did Vader start? The first assumption would be taking over the universe, but I have heard a more interesting theory. 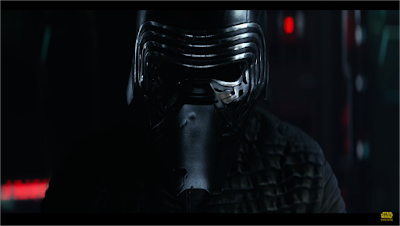 An idea I heard was that Kylo Ren is trying to bring Vader back from the dead. 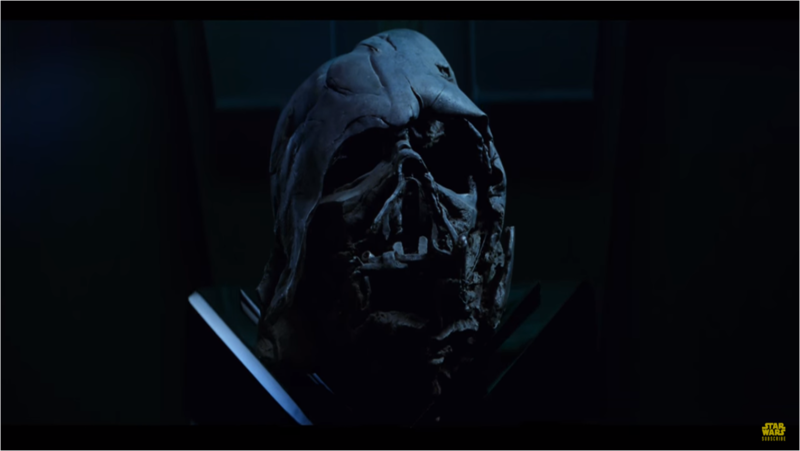 In Star Wars Episode III: The Revenge of the Sith, Anakin's purpose for joining the Dark Side is to gain immortality so he can save those he loves. 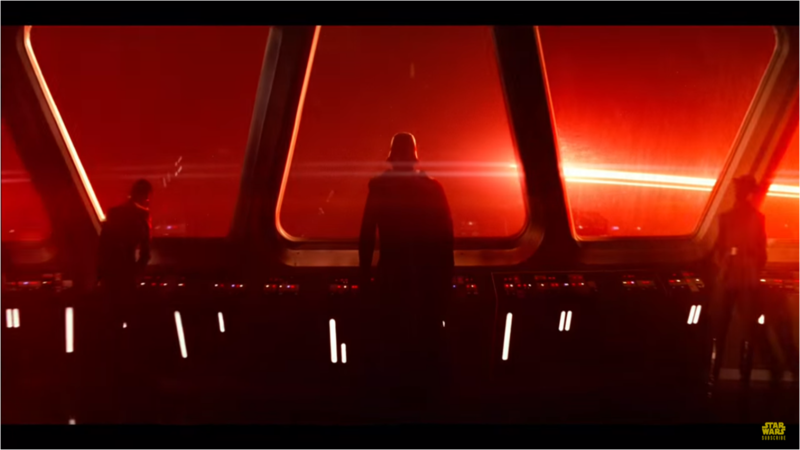 What if Kylo Ren is trying to achieve this, and resurrect Vader. This would make the reports of Hayden Christensen appearing in Star Wars Episode VIII more believable. This is a great badass shot of Kylo Ren. He looks terrifying and awesome in this scene. 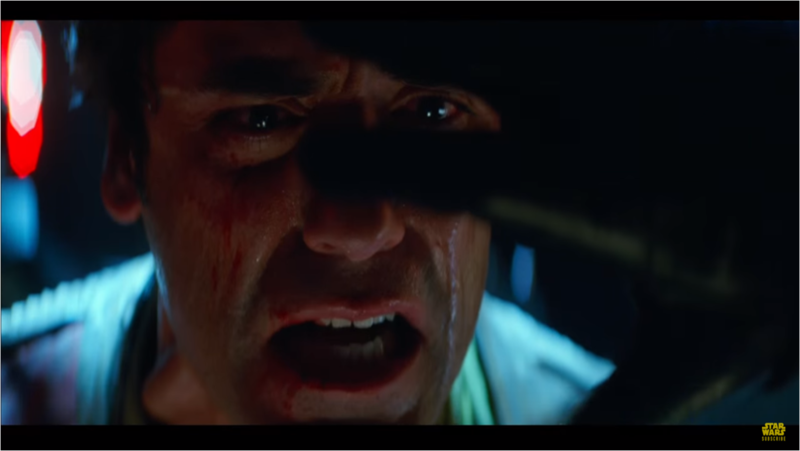 In previous footage, we know that Kylo Ren takes Poe Dameron (Oscar Isaac) prisoner, and now we see him tortured. It's not known yet what Kylo Ren wants with Poe, or why Poe is so important, but Kylo Ren is showing his power in this scene. My first thought was that the trailer was just showing a shot of destruction, but I have read that this is probably mental images being forced into Poe's head by Kylo Ren as torture. That would make sense. 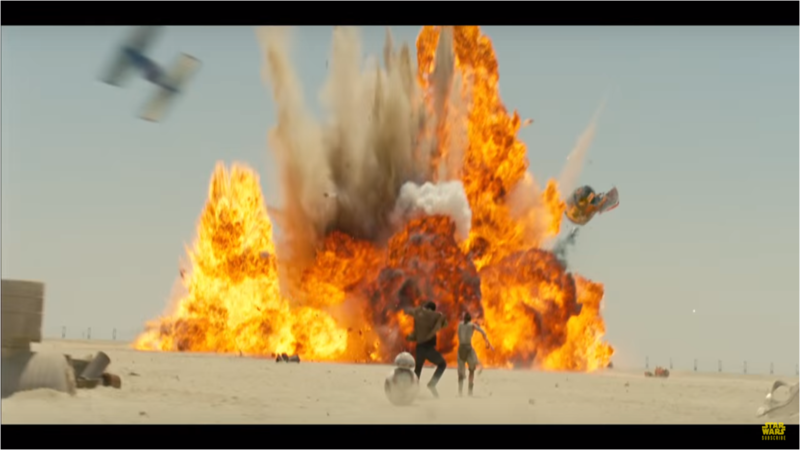 Or maybe Kylo Ren blows up Poe's home world as a way to exert power, similar to Alderaan in Star Wars Episode IV: A New Hope. Here's a great shot of the Millennium Falcon being chased by a couple TIE fighters. 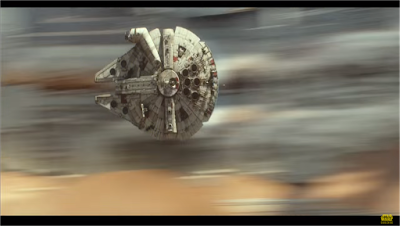 Looking at this makes me honestly feel like a kid again, seeing the Millennium Falcon flying in action. 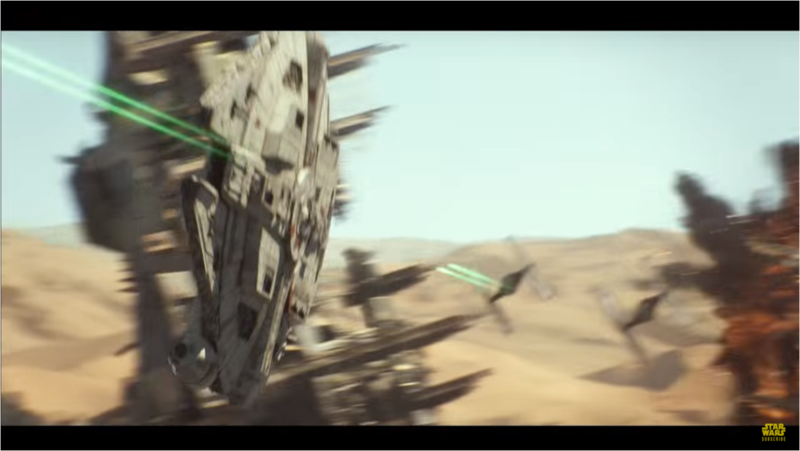 And what's great about these films being made now is that they are able to do things with ships that couldn't be done in 1977. We never got to see the Millennium Falcon twist and weave the way it does in this trailer. 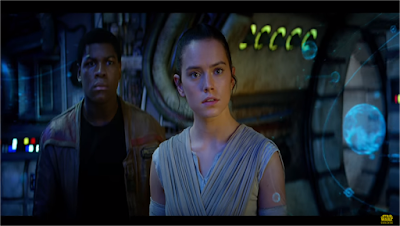 Now we see Rey and Finn in the Millennium Falcon, and who are they talking to...? 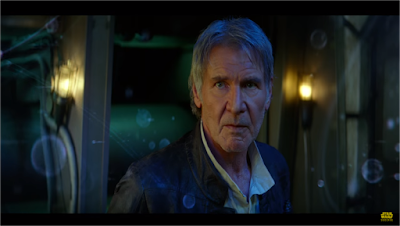 ...Han Solo (Harrison Ford). Now this part is very interesting. 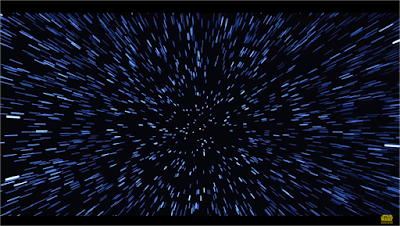 Han Solo is saying that the legends of the Jedi, the Sith and the Force is all real. In A New Hope, Solo says that he doesn't believe in any of it, because he is in control of his fate. It shows a real progression and maturation of his character. I loved this shot because it is very reminiscent of the original Star Wars. It looks perfectly like shots from the original movies. 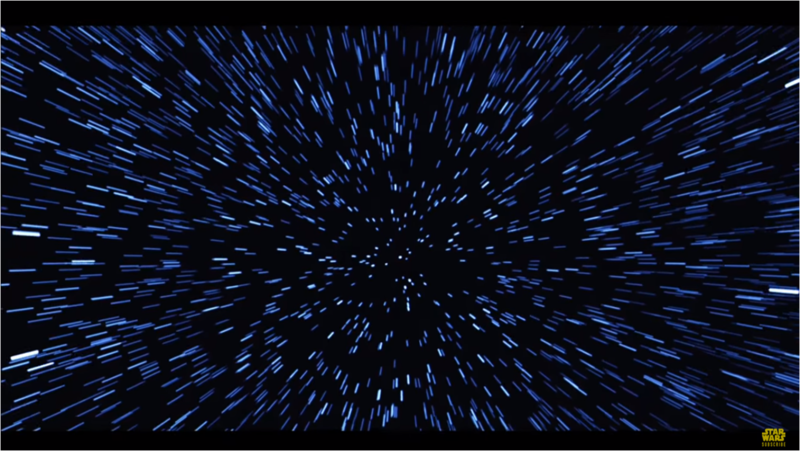 And now we see it's the Millennium Falcon going into hyper-drive. So this is our first look at the Knights of Ren. Abrams has said that Kylo Ren's surname comes from his involvement in the Knights of Ren, an extremist group that idolizes Darth Vader. 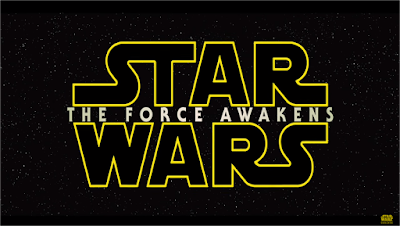 This leaves ambiguity in Kylo Ren's real name, which I'll theorize about later. 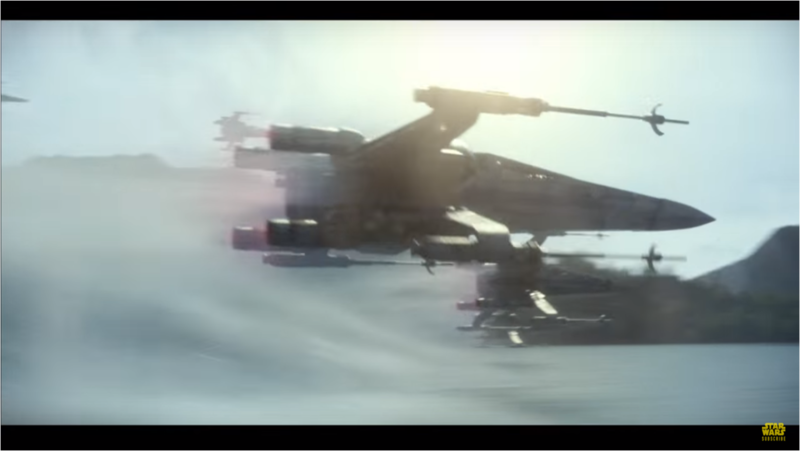 Back to those shots of Poe Dameron and the X-Wings. Another great looking battle. 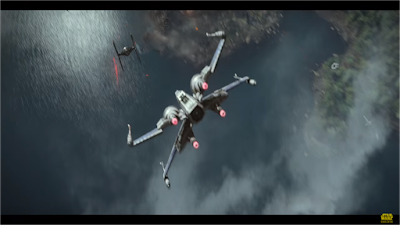 This looks to be part of the X-Wing scene, which is also evident by the next shot. Yep, there goes a TIE Fighter. So what planet is this? 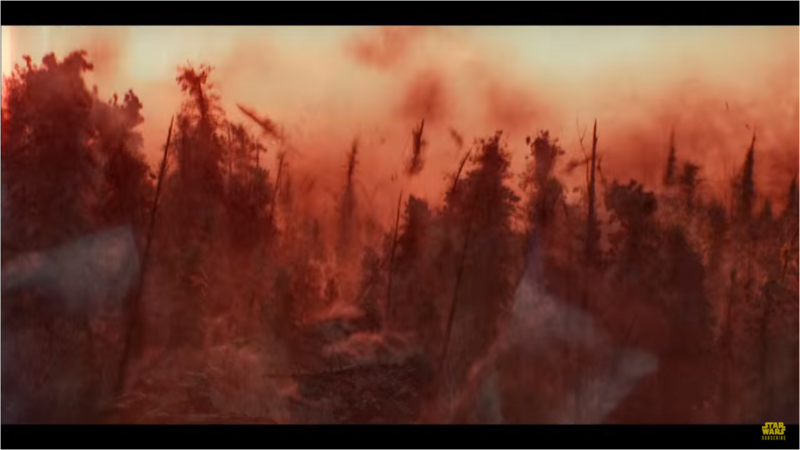 It looks a bit like Endor, but it's probably a new planet. Regardless, it looks fantastic and this is going to be an epic fight. 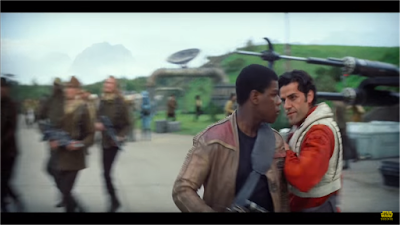 Here Poe touches Finn's shoulder. But look at his face. He doesn't look very pleased with Finn. 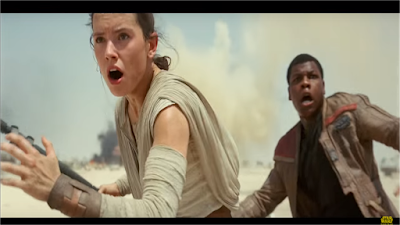 And here Finn has a very "What the f*ck?" face going on. So is there something going on between Poe and Finn. Maybe Kylo Ren was torturing Poe to get information on Finn, and Poe blames Finn for it. Another shot of that battle. We've seen this explosion before, but now we see a TIE Fighter in the corner. I guess the First Order has finally found Finn. 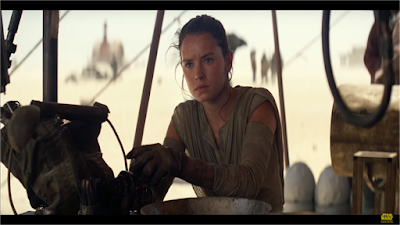 And Rey is caught up in the mix. So they are entering some sort of temple, and there's a new droid. I bet it's just a passing thing that you see walk across the screen. The bigger question is what the temple is. 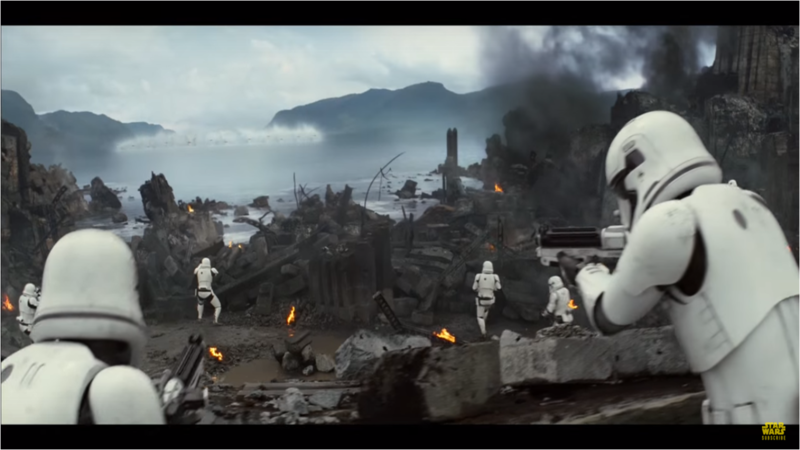 I've heard speculation that this is them looking for Luke, which is possible. Maybe it's not a temple, but something else entirely. I guess we won't know until we see the film. This shot has appeared in other trailers, and I am still convinced this is Luke (Mark Hamill). 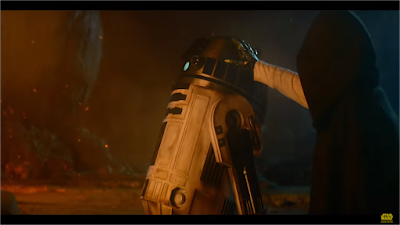 The robotic arm is without a doubt reminiscent of the character, as well as the tender way he reaches out and touches R2D2, his old friend. As to where and when Luke appears is up for debate, but it's looking more likely that Luke won't have a big role in this film. 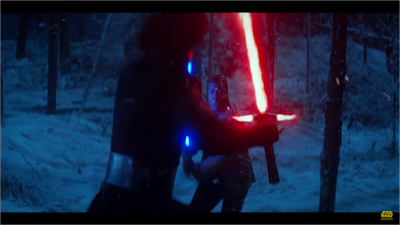 So here's the battle we've seen Kylo Ren in many times before. 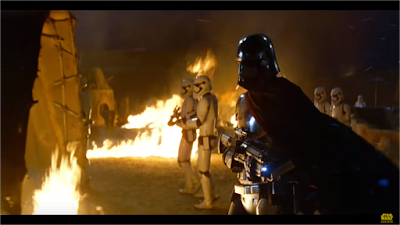 There's Captain Phasma (Gwendoline Christie). 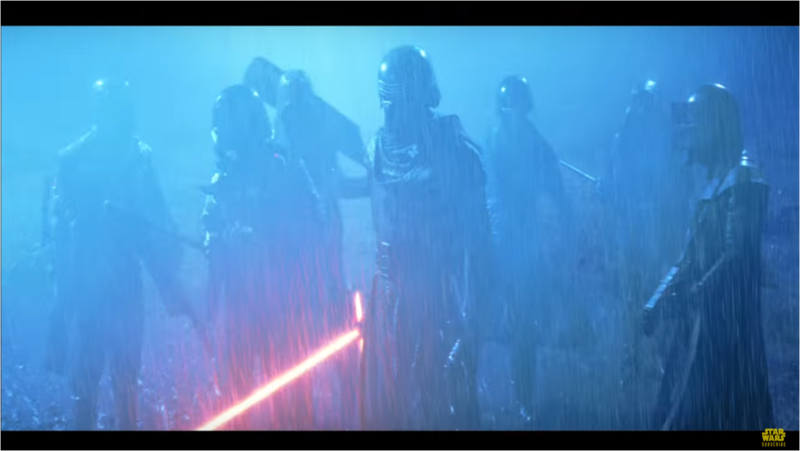 Now, you would think that she's working with Kylo Ren, but the way the shots are aligned, it looks almost as if she is bringing an army against him. Maybe that's just the editing of the trailer, or maybe it's a hint that not all the villains in the movie are working together. 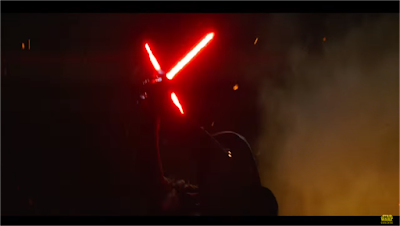 We see this shot of Kylo Ren using his lightsaber again. Now here's where my theories go wild. I am under the (reasonable) belief that Rey is crying over the dead body of Kylo Ren. 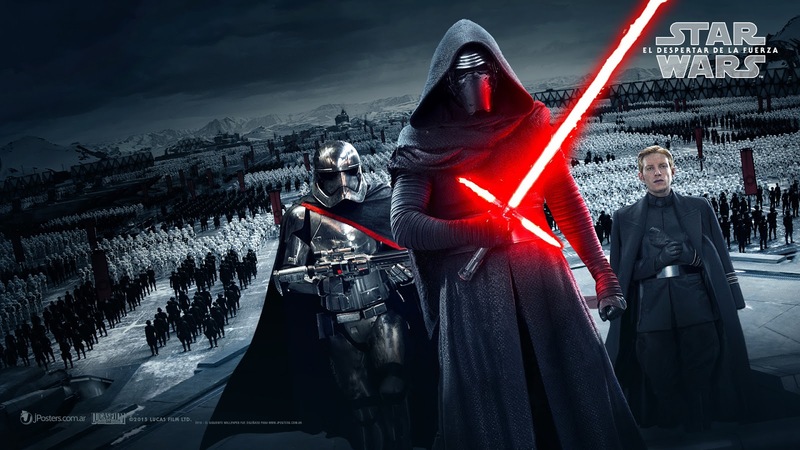 I think Rey and Kylo Ren are siblings. Whether they are Solos or Skywalkers is still up for debate (though I am really leaning towards Skywalkers). But notice the background. 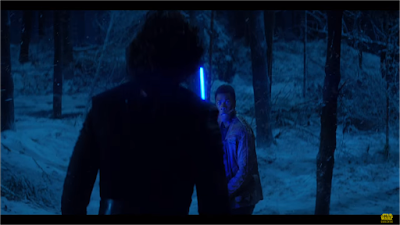 The snow and the trees in this shot is the same is in the scene where Finn and Kylo Ren have a lightsaber fight. 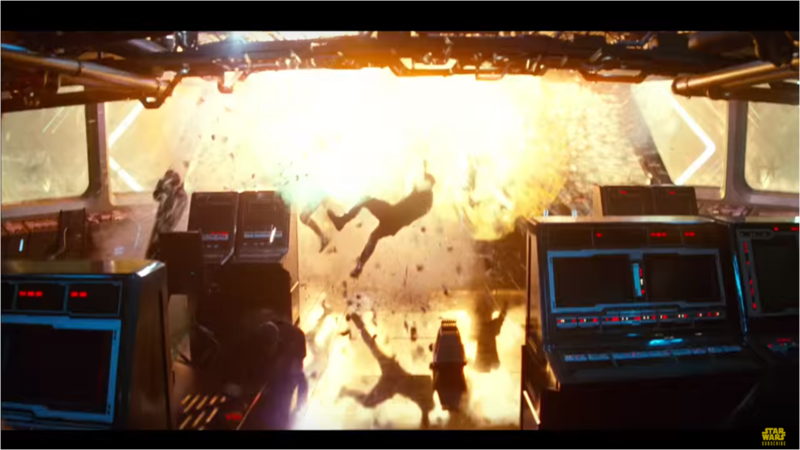 My theory is that this is near the end of the movie. Finn and Kylo Ren fight, and Finn kills Kylo Ren. 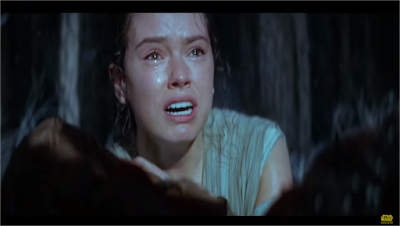 Knowing he is her brother, Rey cries over Kylo Ren's dead body. 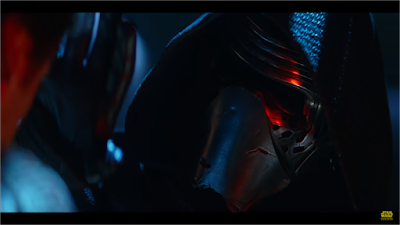 If you look at the head of the body, it looks like Kylo Ren's thick, black hair that you see later in the trailer when he is fighting Finn unmasked. 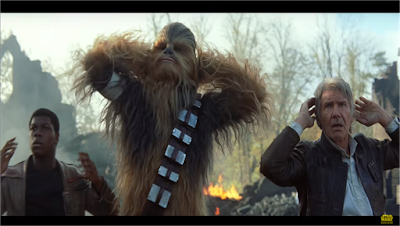 I love this shot, simply because it's Chewbacca (Peter Mayhew) and Han Solo back at it again, this time with Finn. 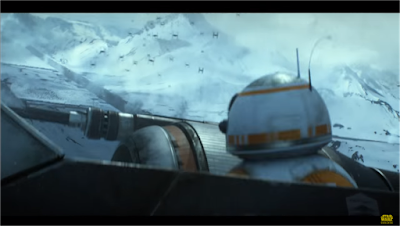 So it looks like BB-8 is Poe's droid. 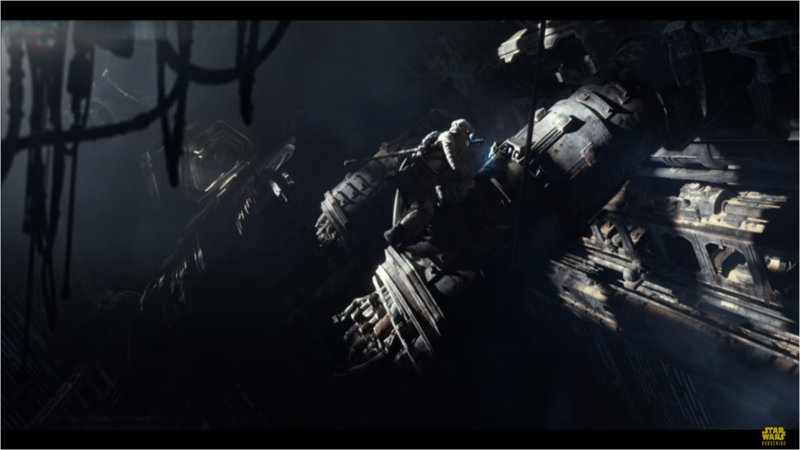 But it seems to be Rey's droid in the beginning. Maybe Poe borrowed him for this mission? Another fantastic air battle. 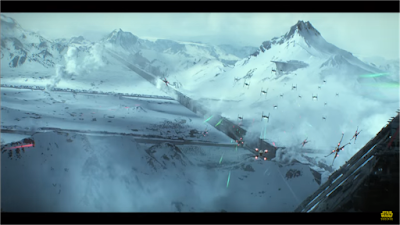 Is this Hoth? I think this shot of the Stormtroopers is back when Finn is one of them. I think they are joining the dark, rainy battle where we see Captain Phasma and Kylo Ren earlier. My theory is that Finn witnesses the destruction and evil of the First Order from that town raid, and goes AWOL. Rey looks badass wielding a blaster. 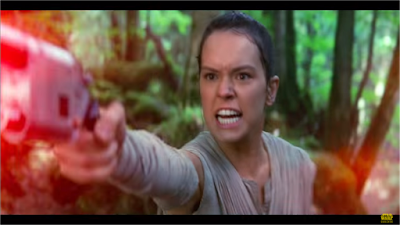 The question is whether we will ever see her with a lightsaber? 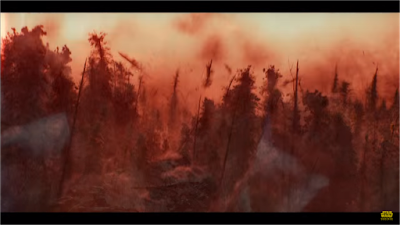 There's a lot of f*cking battles in this trailer. But they all look so goddamn awesome! 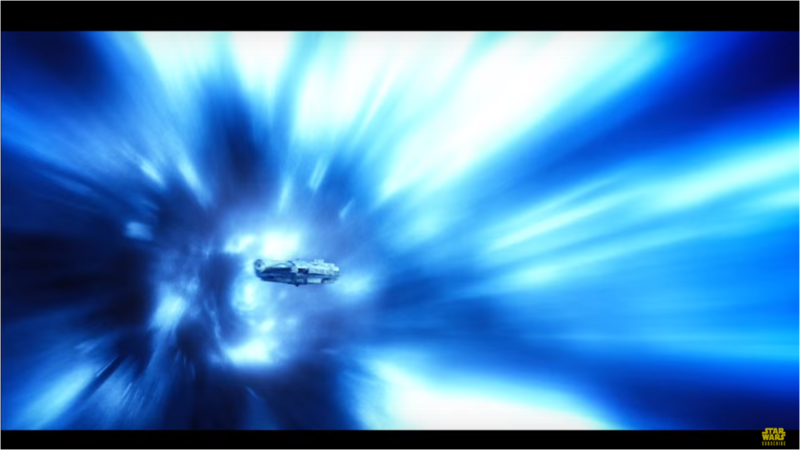 We've seen this shot before, and it's fantastic. 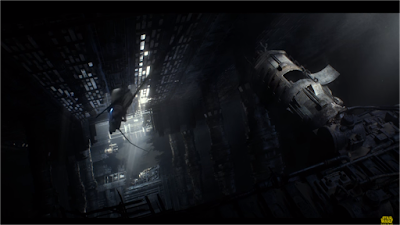 This looks similar to the command base Kylo Ren was standing in earlier, especially if you look at the design of the windows. 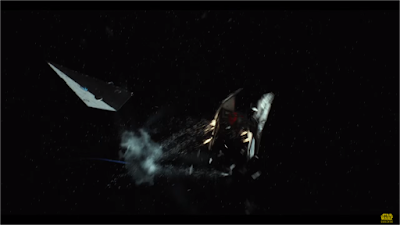 Could this be the destruction of the Star Killer? And here's our first real look of Princess Leia (Carrie Fisher), embracing Han Solo. 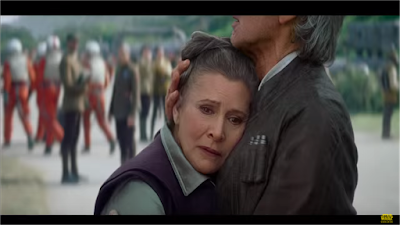 It looks like she hasn't seen him in a long time, which means that Leia and Han's love must have broken off at some time in the past 30 years. 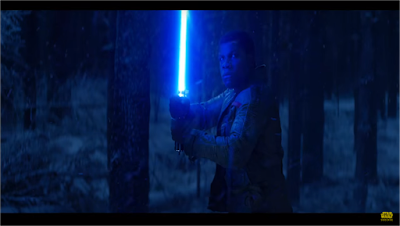 Finn has his lightsaber ready. 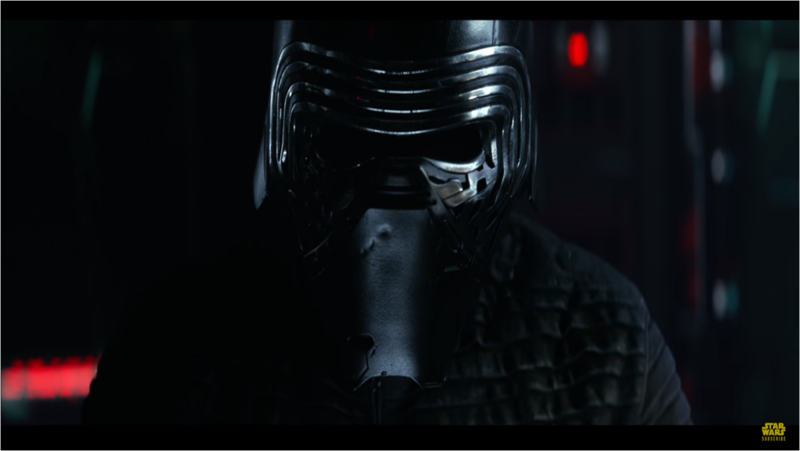 And here comes an unmasked Kylo Ren. Look at Finn's face. 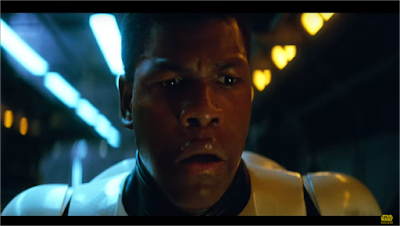 Is he shocked at who Kylo Ren is, or is he afraid of what the villain will do to him? And there's the title shot. What do you think? Do you agree with my theories? Did I miss something? What are some of your theories? Leave your thoughts in the comments section below.